When I moved to Toronto in March 2013, life overwhelmed. New job. New love. Figuring out how to make this new city feel like home. In an unexpected way, I found comfort reading Rhonda Bynre’s The Magic. Writing a daily gratitude list is a lesson and practice from that book that has stuck with me. When you count your blessings at the start of your day, it’s hard to be grumpy, cynical or pessimistic. Like writing, it’s an act that anchors me to the present moment. Life is busy. I know. Building a career as a writer around a day job and other life responsibilities isn’t easy, especially with so much pressure for us to be ‘connected’ 24/7. But sometimes the greatest gift we can give ourselves — one that offers perspective and the possibility of unforeseen insights to move us and our dreams forward — is to step back and give thanks for the blessings in our lives. Turn on the TV, pick up a newspaper, log in to your social media accounts … you’ll witness a startling truth. We live in an age where it’s not just easier, but more the accepted norm, to criticize, insult and belittle each other. Instead of working together to build each other up, we’d rather tear each other apart. We focus more on what divides us than what should unite us. We’re constantly separating ourselves into camps — liberal/conservative, republican/democrat, vegan/carnivore, introvert/extravert — convinced that one is better than the other. And worse, still, we show little or no willingness to understand the other point of view. It’s become an unattractive state of being. Yet there is so much more to life, and we should relish the very gift of waking up each morning to see a new day. Cutting through the noise, my daily gratitude list reminds me of that. In this life, I’m grateful for my partner, family, friends, and job. For the people working to improve the lives of others. For the positivity I welcome into each day, doing my best to bring joy wherever I go. Grateful, yes, to see the beauty that is this world. Everywhere you turn, someone is offering advice: Ten Ways to Maximize Your Instagram Engagement, Five Simple Ways to Advance Your Career, Eight Tips for Effective Time Management, et. al. We scramble to take it all in and sign up for multiple newsletters, online training/webinars, or search for the next great app promising to improve productivity (I’ve done it all). And the next thing you know — badda bing badda boom — you’re living someone else’s dream. And that’s why I’m grateful for having had the courage to listen to that ‘still small voice’ that encouraged me to follow my heart’s true desire. Writing. It’s the one thing in this life that makes my heart sing. So, every day — no matter where I am in the world, no matter the challenges life throws at me — I write. It’s how I know, as my friend Adrienne reminded me, that I’m doing my best to “stay grounded in your conviction that you’re doing what you want to do and feel called to do.” And best of all … I’m doing it my way! When you dare to declare your dream to the world, there’s bound to be people who’ll tell you you’ll fail. They’ll laugh or ask if you’ve been drinking. They’ll be a family member, friend, or colleague. Some will even stop talking to you. Why? You have something they do not: the courage to act, to imagine what is possible and go after it. That’s why I’m grateful for my friends who’ve been with me from the beginning of my writing journey. Not sure how to proceed after receiving the umpteenth rejection letter, they encouraged me to keep writing. Sharing the news my first book was accepted for publication, they cheered, “Yay, you!” When a reader posted a harsh review, they told me to keep writing. And on the days I doubted myself and my talent, they told me to keep writing. These are my personal cheerleaders who believe in me when others don’t, and that makes all the difference. That’s why today, and every day, it’s important to take a moment to count your blessings. 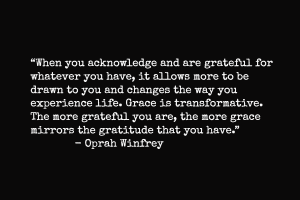 What’s one thing that you’re grateful for today? Click Reply or leave a comment in the section below. I’d love to hear from you.